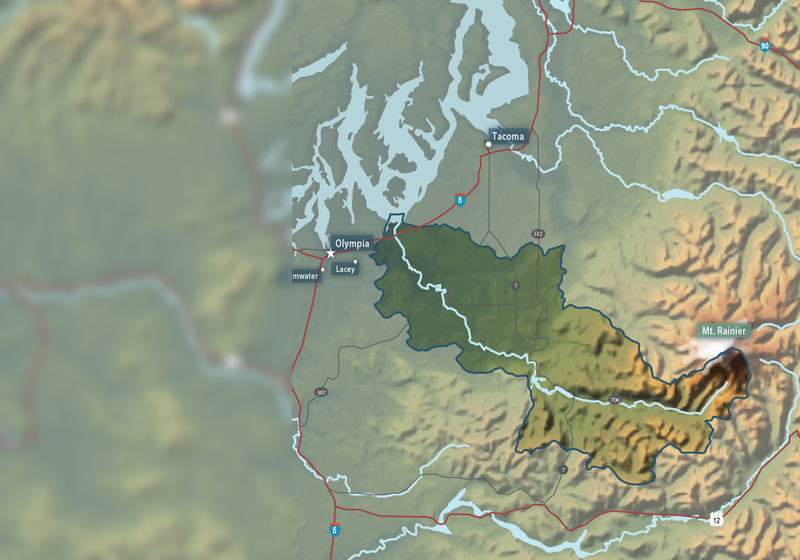 The Nisqually River Basin is located in South Puget Sound approximately 20 miles south of the City of Tacoma and five miles east of the City of Olympia. The Nisqually River originates from the Nisqually Glacier on the southern slope of Mt. Rainier and flows west-northwest for approximately 78 miles, entering Puget Sound at the Nisqually National Wildlife Refuge. Salmon recovery in the Nisqually is guided by the Nisqually Chinook Salmon Recovery Plan, which can be downloaded here. Before restoration. The original dike was constructed in the late 1800s, cutting off tidal inundation to 1000 acres of former estuary. 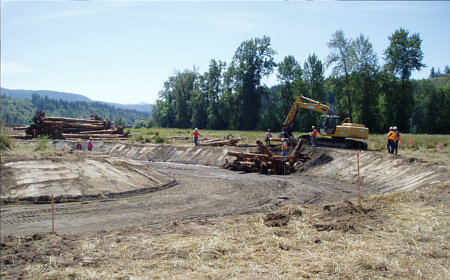 The restoration of this habitat is the highest priority action in the Nisqually Chinook Recovery Plan. 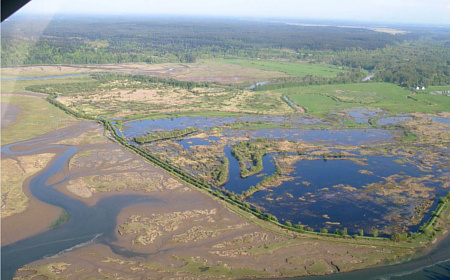 The Nisqually National Wildlife Refuge after restoration. 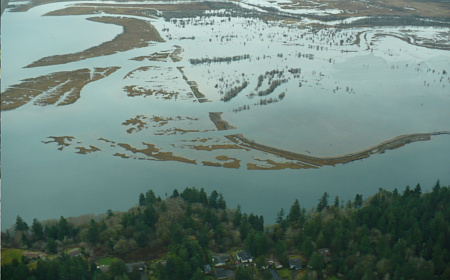 The restoration project, completed in 2009, opened up over 760 acres to tidal inundation and reconnected over 20 miles of tidal sloughs with Puget Sound. 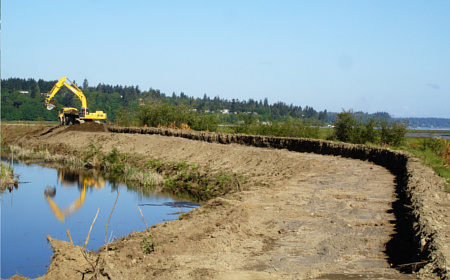 Over 4.5 miles of dike were removed during the Nisqually National Wildlife Refuge estuary restoration project. Monitoring fish usage at the restoration project. 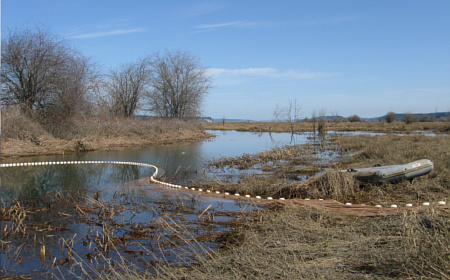 The Nisqually Delta is the site of a multidisciplinary research project to evaluate the response of Chinook salmon and other wildlife to restored tidal and riverine processes. 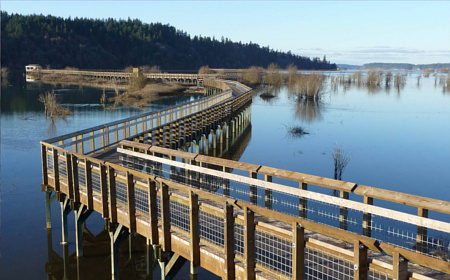 The Nisqually National Wildlife Refuge boardwalk offers visitors a unique opportunity to stand over a restoring estuary. Lower Ohop Creek was ditched along most of its length to drain the valley for agriculture and reduce flooding. Phase 1 relocated over 1 mile of ditched creek into a natural stream and restored 100 acres of floodplain wetland habitat. Construction of the new Ohop Creek channel. 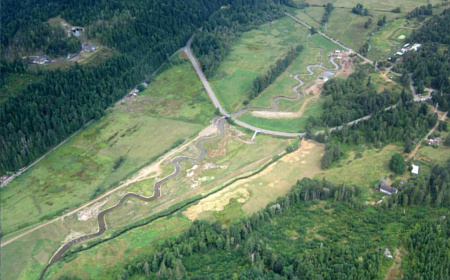 The new channel was shaped to provide maximum habitat value for juvenile salmon. 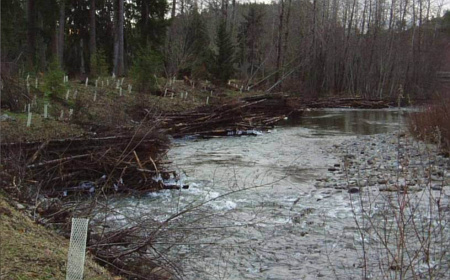 The restored Ohop Creek channel features logjams and other habitat elements important for juvenile salmon. 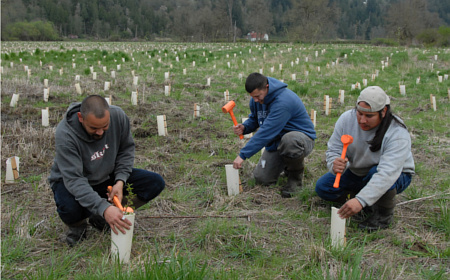 Native plant restoration is an important component of the Ohop Creek Phase 1 restoration project. 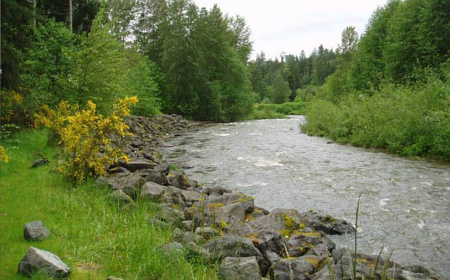 The Mashel River is an important Nisqually tributary for Chinook and other salmonids. This stretch in Eatonville was armored with rock riprap, reducing its habitat value for salmon. 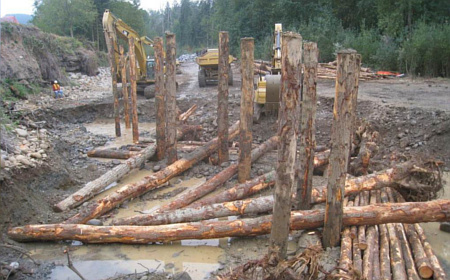 The Mashel River restoration project removed the riprap along Smallwood Park in Eatonville and installed logjams. 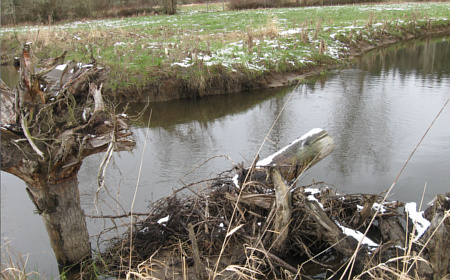 The logjams have increased the habitat complexity of the river. 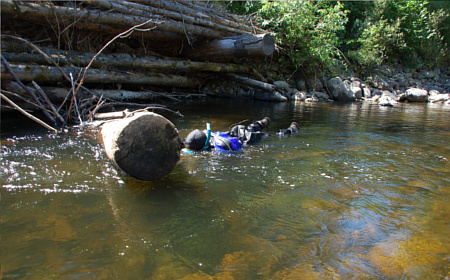 Several large log jams were constructed in the Mashel River at Smallwood Park. Snorkel surveys in the Mashel River are part of on-going monitoring and evaluation of the restoration project.